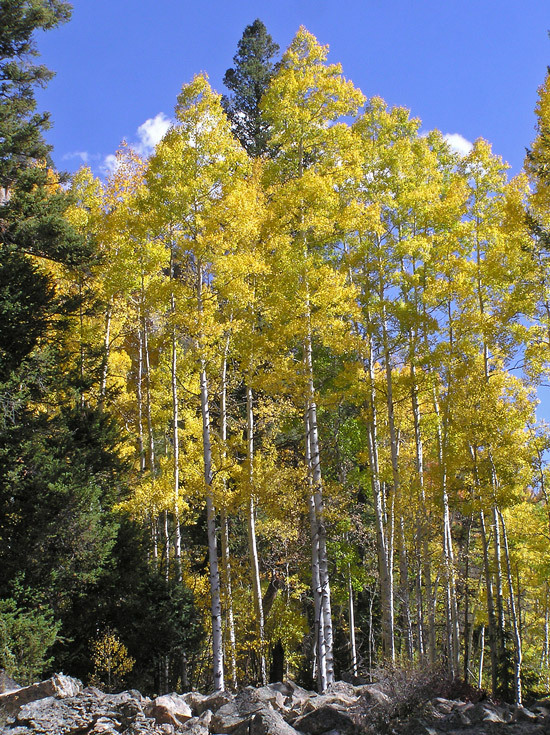 Found coast to coast across North America, aspens grow in groups called stands. Within these stands, a single tree will spread by sprouting new stems from its roots that either sprout into new trees or live underground, sharing nutrients with each other for a long time. Aspens are a favorite of my wife, Cindy. She likes how the leaves "waver" in the wind due to their triangular-shaped stems. An Our Daily Bread devotional we read together last week offered another aspen feature - how their underground root system plays a vital, re-foresting role after a natural disaster. Apparently, aspen root systems sleep underground for hundreds, even thousands of years, whether or not they produce trees. After a fire, flood, or avalanche clears a space for them in the otherwise shady forest, aspen roots can sense the sun at last, sending up saplings that become trees. “Just as natural disaster clears a forest to make new aspen growth possible, our growth in faith is also made possible by difficulties,” wrote ODB contributor Amy Peterson. “Consider it pure joy whenever you face trials of many kinds,” wrote the apostle James, “because you know that the testing of your faith produces perseverance. Let perseverance finish its work so that you may be mature and complete, not lacking anything.” (James 1:2–4). According to James, not lacking anything is what a mature and complete faith looks. That’s problematic for me. While I can claim occasional moments of not lacking anything, I generally lack something that I want or convinced myself I need. Pride is my struggle. As a guy, I want to support my family and be competent and capable in my responsibilities especially in my work/career. Unable to secure or retain positions that sync with my competencies, I've accepted other work where I struggle through learning processes that inevitably include embarrassing rookie mistakes. Each new position presents a new learning curve to work through. I try to handle the inevitable rookie errors with grace but often I'm shrinking inside, my self-confidence taking another hit. Are these tests of my faith, of God coaxing me, ever reluctantly, to trust more in him and less in myself? While I do find being a rookie again for the sixteenth time in nine years a little frustrating, I am better about not letting the next mistake "get to me" or define me. As I gradually learn new duties, I remind myself to thank the Lord for another opportunity to “let perseverance finish its work” in me. Like the aspen roots grow underground for a chance to re-forest a devastated region in the distant future, God allows and uses devastation in our lives for his own, re-foresting-type purpose. Jesus himself established this "organism" that he invited me into, where my maturing faith feeds yours and ours melds with other believers. Collectively, we are "growing underneath" but seen and approved by God, nurtured into a formidable, reckoning force . May I suggest that the largest organism on Earth isn’t a tree after all?